Enter your details using the 'About you' button in 'More info'. 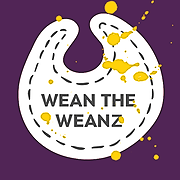 This information is used by NHS Lothian for service improvement and evaluation of the Wean the Weans mobile phone application ('the application') only and will never be passed to any third parties. For more details, please see the privacy statement. You can change your details at any time by tapping the 'More info' buttons on the app homepage and clicking on 'About you'. The quiz helps you decide if your baby is showing signs of being ready to wean. There are many myths about weaning. This quiz helps identify if your infant is showing the correct signs. The Photo gallery allows you to track your baby's weaning journey first year. Enabling notifications will allow you to receive reminders about events to include in your baby's journey. e.g. first solids and first finger foods. You will receive age specific notifications on matters relating to weaning. You can manage these notifications in the 'Settings' function. This section contains recipes, a meal planner, a shopping list and a check list for equipment and ingredients. You can add a recipe to your meal planner using the calendar provided. You can choose if this will be for breakfast, lunch, dinner or snack. You can add meals from your meal planner to the shopping list so that you have a list of items to purchase. Items may be removed from the list e.g. if you have them at home already. This will let you check you have the basic equipment needed to prepare the recipe. This section provides information on what a day might look like at specific ages for food and sleep. This section provides basic weaning advice, safety information and top tips. This is categorised by approximate infant age. The application gives general advice based on the information you provide. You should always discuss your weaning intentions with your health visitor. If your child develops a rash or has an allergic reaction, phone your health visitor or, if it is out of hours, phone NHS 24 (111). In the unlikely event of a severe reaction or a choking incident, where your child is unable to cough, cry, or breathe properly, you should call for an ambulance (999).